New BlackBerry 10 Devices Impress - But Can They Save RIM? CIO.com's Al Sacco went hands-on with RIM's first BlackBerry 10 smartphones, and both the hardware and software are unique and innovative. But the devices still might not be enough to revive RIM and the BlackBerry brand. Here's why. You may not have noticed, but BlackBerry-maker Research In Motion (RIM) has been on a media blitz during the past few weeks, showing off its upcoming BlackBerry 10 smartphones to select reporters and bloggers in "off-the-record" demonstrations. Yesterday, I got some hands-on time with both of RIM's first two BlackBerry 10 smartphones. One is an all-touch device that looks like a polished version of RIM's BlackBerry 10 Alpha device that was distributed to developers in May; and the other looks like an evolution of RIM's Bold line of devices--though it's unclear if it will be called Bold--with a touch screen and a full QWERTY traditional BlackBerry keyboard. RIM told the media that we can share general opinions of the devices and software, but not specifics, such as technical specifications or hardware features. Some details have already been released, including the screen resolutions of both handhelds (1280 x 720 for the touch device and 720 x 720 for the QWERTY BlackBerry) and the fact that both devices have removable batteries. Both devices are expected to be released in early 2013, with the all-touch BlackBerry 10 device releasing shortly before the full QWERTY handheld. These first two devices will represent RIM's "high-end" tier of BlackBerry 10 devices, and RIM plans to release two more pairs of devices--one touch, one QWERTY--to cater to the mid- and entry-level tiers later in 2013. The first two devices will also presumably support 4G LTE, since RIM CEO Thorsten Heins recently cited a lack of LTE support in current in-market BlackBerry devices as one of the issues that caused RIM to lose market share to rivals including Apple and Google. The majority of feedback from the media on the first two BlackBerry 10 devices has been positive. But I'm still not sure these two devices, and the additional BlackBerry 10 handsets RIM releases next year, will be enough to reverse RIM's rapidly declining market share and save the BlackBerry brand. I'll explain why shortly. But first, some thoughts on the upcoming BlackBerry 10 hardware and software. As stated earlier, the device looks very similar to the BlackBerry 10 Dev Alpha developer device with some cosmetic enhancements to pretty it up. 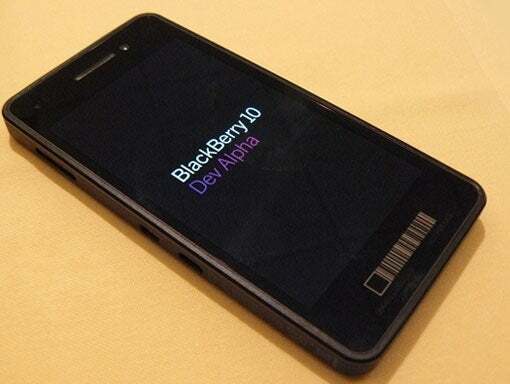 (Check out these images for an in-depth look at the BlackBerry 10 Dev Alpha smartphone.) I will say that the all-touch BlackBerry 10 phone isn't as sleek or as slim as some of the newest Android phones. But it's quite light, and it's still easy on the eyes. Personally, I'm much more interested in the full QWERTY BlackBerry 10 device anyway, since RIM's top-of-the-line "physical" keyboard is the main reason I'm still using a BlackBerry. Late last year, shortly after RIM made BlackBerry 10 official, it became clear that the company was strongly focusing on touch and all-touches devices in its next-generation OS. This worried me a bit, because I love RIM's hardware QWERTY keyboards, and I wrote a post urging RIM not to forget how important those keyboards are to most loyal BlackBerry customers. After spending some time with the new QWERTY BlackBerry 10 device, my concerns are completely alleviated. RIM definitely did not let down customers who love that QWERTY hardware keyboard with this new device. The keyboard is fantastic, and even though I only spent a few minutes typing on it, I was impressed right away and plan to get a new BlackBerry 10 QWERTY smartphone as soon as possible. One blogger I read who is relatively unbiased when it comes to RIM and BlackBerry, and technology in general, is The Verge's Joshua Topolsky. RIM gave Topolsky a BlackBerry 10 demo a couple of weeks ago, and he wrote that the software feels very much like what had already been seen in official demonstrations and on the BlackBerry Dev Alpha device. I disagree. The software is far more polished now than ever before. The BlackBerry 10 software is smooth and snappy, though the camera app froze momentarily when I tried to access the image gallery after taking a few photos. The software is still being tweaked so some minor issues are expected. Again, I can't get into too many specifics, but one of RIM's main goals when creating BlackBerry 10 was to eliminate some of the steps that modern smartphone users have to take when launching and switching between apps, to speed up and streamline the processes. At the heart of this effort is a unified inbox that serves as a central hub for checking all of your various notifications without ever stopping what you're doing. Gestures are also particularly important to BlackBerry 10, and RIM came up with some cool new ways for users to interact with the devices, apps and the touch-screen keyboard using simple gestures. Some of these gestures will take some getting used to because they really are different than anything that's available today. But the gestures are well thought out, and they should eventually become second-nature to users who learn and use them. "Just tell (us) if it is gonna fly or die. Black or White. No mid option." I know just how he feels. And I know millions of BlackBerry users feel the same way. Unfortunately, it's just not possible to at this point to say if BlackBerry 10 will save RIM. Most of my opinions stated above are positive. That's because I'm honestly impressed with BlackBerry 10. I left the demo feeling optimistic for RIM's future. But it's my job to be realistic. As impressive as the BlackBerry 10 software is, and regardless of how much I like the QWERTY device, RIM is facing an up-hill battle in reviving the BlackBerry brand. The number one challenge for RIM: Apps. Regardless of whether or not the average smartphone user really needs even a fraction of the mobile apps available on RIM-rival platforms, including iOS and Android, the users think they need them. And in this case, perception has become the reality. It's a fact that RIM has fallen behind its rivals when it comes to app quality and selection, and this is a huge reason why RIM decided to release a brand new OS instead of improving on its old foundation. The current BlackBerry OS is difficult for developers to work with, and BlackBerry 10 should be a lot simpler for developers. RIM's future isn't just about the BlackBerry 10 hardware or software; it's about developer support--and not just independent developers but the big-name developers that have shunned BlackBerry in the past. The Netflixs. The Amazons. Dunkin' Donuts and Starbucks. Instagram. RIM tells me it is well aware of this problem, and it's courting both smaller developers and the large, corporate developers through a variety of initiatives meant to raise the profile of BlackBerry 10 and inform developers of the benefits of creating software for the new platform. For example, RIM will hold a number of developer events, called BlackBerry Jam sessions, in a variety of countries in the coming months. To sum all of this up: RIM is putting forth an admirable effort to remain in the mobile game with BlackBerry 10. And it's not taking the low road by simple copying features and functionality found in other mobile platforms. Unfortunately, RIM's position in the market has reached a point where unique hardware and software will not matter if the company cannot convince the developers and partners required to sustain a healthy mobile ecosystem that BlackBerry 10 is worth their time and money.